Nicole Kidman is returning to the superhero universe this year for the first time since Batman Forever. In James Wan’s Aquaman she’ll play a queen of the seas as Arthur Curry’s mother. But what will Kidman look like in a DCEU movie? Will she have a mermaid tail? Fins? Will she be covered in rad tats and leather bracelets like her son? Finally, our questions have been answered. Entertainment Weekly‘s latest cover is all about Jason Momoa’s oceanic superhero. 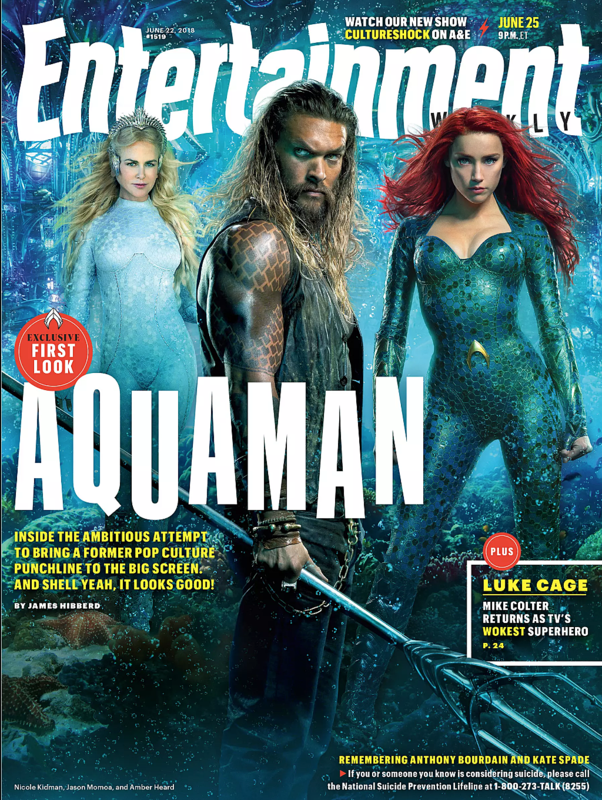 While the main cover looks like we caught Momoa mid-shower, the alternate cover has the first look at Kidman’s Aquaman costume, along with the first look at Amber Heard’s Mera in the film (along with her new outfit). Phew, thank the sea gods Kidman doesn’t have tribal tattoos. In the film she plays Queen Atlanna, Curry’s mother. In the comics, she’s the Princess of Atlantis who runs away and meets Aquaman’s dad, lighthouse keeper Tom Curry. While Heard first debuted her Mera in Justice League, she’s getting an upgrade on her look for the solo film. Instead of the battle armor look and headpiece, she’s got a scaly blue-green suit. Wan told EW that the underwater world of his movie will set it apart from every other DCEU film. Apparently it will feature characters “riding great white sharks, giant octopi, seven different underwater kingdoms, trench-dwelling cannibals, and even sea dragons.” If we get to see Nicole Kidman in a mother of pearl bodysuit riding atop a giant octopus then I may just forgive the crimes of the rest of the DCEU; it’s all worth it for this. Aquaman hits theaters December 21.